SanDisk first really caught my attention a few weeks ago after I bought one of its very well-designed U3 flash drives. In one of those all too rare times, SanDisk got the obvious right. They eliminated that little cap which frequently gets lost and supposedly attaches to your keyring. Instead, the USB connector simply slides back into its own case. Egad, Brain! Brilliant! 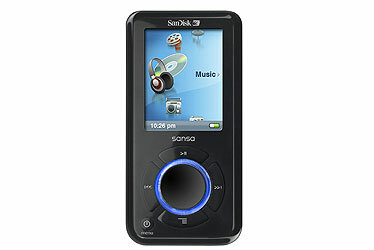 However, today The Distillery brings you the SanDisk Sansa e280 MP3 player. And quite frankly, never being one to jump on bandwagons, I very much prefer it to any iPod I’ve seen. And then there’s that something about buying music from only one seller who allows that music to be played on only one player — theirs. However, with the recent cracking of Microsoft’s DRM anti-copying protocol, you may well be able to remove that protection and play your music in any player or computer you wish. Just download FairUse4WM 1.1 at Betanews.com and use it on your collection before Microsoft can get back to being Big Brother. It is always a good idea to see what Microsoft is up to at the Redmond Country Club. After all, Microsoft invariably takes the fore in introducing breakthrough technologies, right? Of course. And, it does so once again with its Microsoft Shared Computer Toolkit for Windows XP. But all kidding aside, this appears to be a free product from Microsoft targeted toward environments where users must share computers — schools, internet cafés, etc. And as someone who often encounters computers used by more than a single person, I can fully attest to the need for keeping them both operational and secure. The havoc wrought to a personal computer by either a determined or clueless person can be almost beyond belief. Especially for schools and educators, The Distillery recommends the Shared Computer Toolkit be given a much closer look. And if you like what you see, it can be downloaded here. But if you want more information than given in the demonstration already linked, then point your cursor to the installation and configuration demo. You will know better what you’re getting yourself into. Microsoft and Razer have taken the wraps off over at NotForNoobs.com. And what was the suspense about? And, how did The Distillery know beforehand, which is evidenced by the picture of a mouse used in the first posting? AlienWare and Superman. Nice fit. Super-fast computers that often look like sinister other-worldly machines and the depiction of a Superman who looks not at all mild-mannered. If you think only 350 laptops is a limited edition, then how about only 250 Area-51 Superman Desktop Editions? That’s right, regardless of the one you want, you’d better hurry. But remember, AlienWare computers are far from cheap. You might want to take along both credit cards. The AlienWare-Superman co-branding is almost a stroke of genius. The entire promotional site does not disappoint. It is indeed a super site. Enjoy. The Distillery very much likes the SitePal product, but for one problem. That is, even after a customer has purchased SitePal (albeit at its most basic level of $100/year), the company still insists on conspicuously including its advertising in what has then become the customer’s product. All that aside, what about SitePal’s online content? This is an easy one. After all, SitePal literally speaks for itself. SitePal is a virtual spokesperson which can be added to a web site, and without question adds a most unique and engaging dimension for visitors. It brings to mind something marketers recognized as often necessary years ago: If you go high tech, find someway of also going a little high touch. Although not human, and because avatars have become more acceptable to internet users, there is little question that SitePal potentially offers that element of “high touch” needed by so many web sites. Also, unpublished research has confirmed that an avatar can make a site’s visitors feel more comfortable and therefore more satisfied with their interaction with the site. (Thanks, Prof. B.Q.) However, The Distillery has yet to encounter a single web site employing SitePal’s technology. As recently as April 2006, SitePal had only 5000 customers after being in business for at least 3 years! (There’s nothing like shooting oneself in the foot, eh?) Therefore this unsolicited advice is offered to SitePal: Remove the glaringly obvious barrier to your product’s adoption. If a customer is willing to pay for your product, you should be willing to remove your advertising from what has then become your customer’s product. Even more, cannot your product speak well enough for itself? (Pun intended.) Or, do you not trust that it can? I expected great things from Silicon Graphics (SGI). Unfortunately, its web site and decidedly boring streaming videos dashed those expectations. Although SGI typically does not sell to the general public or average end user, someone is forgetting it takes not only a good steak to remain in business, but also some sizzle to sell even to professional, government, or industrial markets. That miscalculation may be evidenced by Silicon Graphics’ recent filing for Chapter 11 bankruptcy protection. Might this be a case of a firm thinking its products simply sell themselves, and thus very little emphasis or consideration are given to the internet as one of its best (and expected) promotion and information tools? Seems so. Although SGI has a streaming media center, does it really think it will grab the attentions of “just-doing-my-job” corporate or government buyers with videos as boring — and outdated — as this one for the U.S. Army Tank and Automotive Command (TACOM)? Maybe SGI purposefully works hard at producing boring online content. How else does one explain turning multimedia clips of NBA basketball played by Michael Jordan, Vince Carter, and Lebron James into bathroom breaks?! And with this video of SGI’s use by digital media firms, it seems to have a slight clue, but still misses the mark. In sum, as SGI reorganizes itself under Chapter 11, let’s hope any new management understands they actually have to properly promote and sell products to remain in business. As a company once considered the absolute leader in graphics, and with graphics taking over the entire internet in the forms of movies to 3D simulations, maybe Silicon Graphics should pay a bit more attention to using some of its silicon and graphics on the web for “Wow!-ing” potential buyers with their products. Otherwise, we’ll be reading about SGI in another chapter in the bankruptcy book of fairy tales — Chapter 7. Home page: Silicon Graphics, Inc.